Sagamore Company Store at McComas, West Virginia in the 1930's. This photo was furnished by JIM MATHENA. Jim discovered this photo among his late Mother's collection. This photo was at first incorrectly identified as the Sagamore Boarding House. Jim's cousin, TERRY TABOR, has corrected this mistake and provided the following excellent description of the photo and general area of the store. "Jim, this is not the Club House. It is the Company Store. On Pat Smith's site there is a front view of the store coming up the road from Pinnacle. Your view is looking down from the very end of Sagamore Hollow. It's where Sagamore Hollow road intersects with the main road running through McComas. There is a little house on the left (picket fence). Across the road and beside the store (on the left) is the doctor's office. Behind the Drs. Office and the store is the train track which came down from Crane Creek and went down through McComas on to Bluefield. 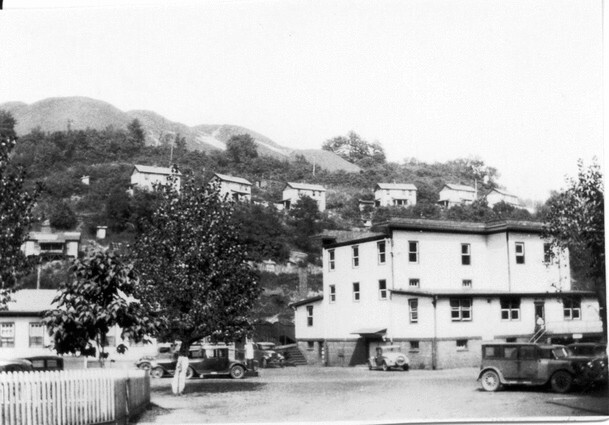 The hill behind the store was a slate dump and the houses on the hill were occupied by black families in the community. We lived on the hill opposite from the hill you see just to the right from where the picture was taken. The Club House was behind the picture taker about 600 - 800 yards up the hollow. I'm sure I'm correct on this."